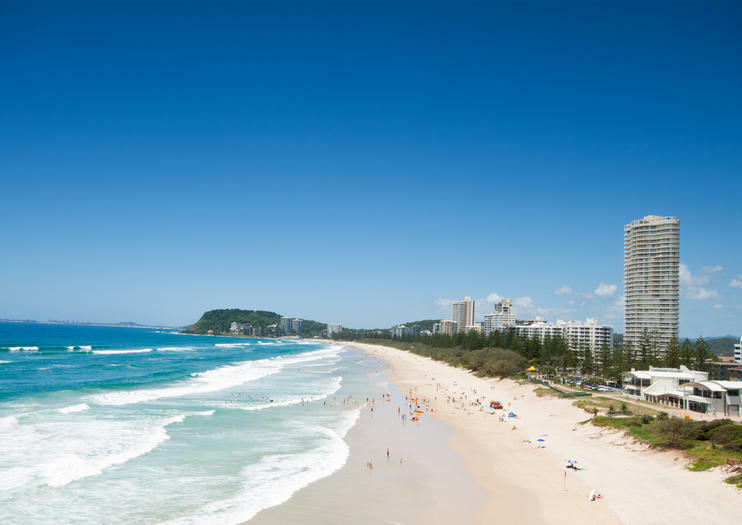 Located between Surfers Paradise and Coolangatta on Queensland’s Gold Coast, Burleigh Heads is known for its beautiful clean beaches lined by scenic parkland, as well as its world-renowned surf. Laid-back and relaxed, yet full of hip and trendy dining and shopping options, idyllic Burleigh Heads has plenty to offer visitors. Known for its surf break, the wide-open beaches of Burleigh Heads are also great spots for kitesurfing. Families and sunbathers will delight in the long stretches of clean, and well-patrolled, beaches. There are sheltered coves for swimming, snorkeling, and kayaking, as well as well-maintained parkland with barbecue, picnic, and play areas, plenty of shade, and walking and cycling tracks. Nearby James Street is packed with shops, cafés, and restaurants. Don’t miss offerings by local artists and designers at the Village Markets. The David Fleay Wildlife Park, Jellurgal Aboriginal Cultural Center, and Burleigh Head National Park are all well worth checking out as well. Beginners can learn to surf in Burleigh Heads, while more experienced surfers can embark on a multi-day surfing expedition. Or explore more of the Gold Coast on a full-day tour that includes stops at Burleigh Head National Park, Broadbeach, and a crab-catching cruise. Temperatures in the summer can reach over 82°F (28°C), so don’t forget to pack a hat and sunscreen. Swim only in designated areas and when lifeguards are present, as the waves can be strong. Red and yellow flags indicate the beach is patrolled. Burleigh Beach offers various facilities for wheelchair users, including accessible restrooms, beach access, viewing platforms, beach matting, and beach wheelchairs. Burleigh Heads is located in the middle of the Gold Coast, 7 miles (11 kilometers) south of Surfers Paradise. It’s about 68 miles (95 kilometers) south of Brisbane Airport and about 8 miles (13 kilometers) from Gold Coast Airport. By car, take the Pacific Motorway and exit the Reedy Creek Road. The sun shines year-round at Burleigh Heads (around 300 days a year on average), but temperatures are at their highest during the summer (December to February). November and December are busy periods, given “schoolies” and public holidays, and prices will be at their highest. Visit in April or May for fewer crowds and lower prices. Burleigh Heads National Park features some of the best views on the Gold Coast. Located between Burleigh Beach and Tallebudgera Creek, this small park covering 67 acres (27 hectares) offers coastal and rain forest walks. Look for whales in the winter and butterflies in the summer. Este tour privado asequible (aproximadamente el costo de 3-4 asientos en un autobús turístico lleno de gente) con su guía local Michael con hasta 7 asientos disponibles, le permitirá sentarse, relajarse y disfrutar de un agradable día conduciendo por el hermoso Gold Playas costeras todo hecho en tu tiempo a tu ritmo.